3-D Web is the set of internet technologies that put user browsers in an online, interactive 3D environment. MOSES (Military Open Simulator Enterprise Strategy) is a privately-hosted, OpenSim, online virtual environment with stringent security from hackers. The MOSES Community is a professional, online networking group researching the ability of OpenSimulator platforms to provide independent, high-security, high-performance access to three-dimensional, online, interactive virtual environments. Backgrounds include military, technology, government, education, industry, and arts. Hypergrid Business Journal is an online magazine for entrepreneurs, covering OpenSim technology and community and alternative open source virtual worlds platforms. 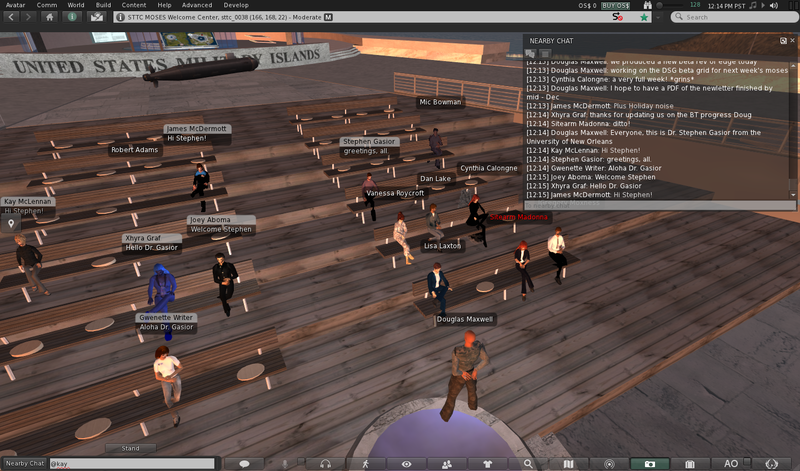 Hot topic at today’s MOSES Office Hours was publication in this week’s Hypergrid Business Journal of two articles, Military grid hits performance goals, by Douglas Maxwell, and Where the MOSES grid gets its content, by Maria Korolov.